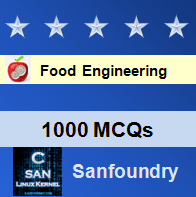 This set of Food Engineering Multiple Choice Questions & Answers (MCQs) focuses on “Principles of Food Freezing-2”. 1. Statement 1: Proteins which undergo proteolysis do not vary by nutritious values from native protein. Statement 2: Proteins which undergo proteolysis vary by appearance and quality of food. Explanation: Proteins which undergo proteolysis do not vary by nutritious values from native protein. Proteins which undergo proteolysis vary by appearance and quality of food. 2. Enzyme activity is more in super cooled water than in crystallized water at the same temperature. Explanation: Enzyme activity is more in super cooled water than in crystallized water at the same temperature. 3. Fats in frozen fish tissue tend to become rancid quicker than fats in frozen animal tissues. Explanation: Fats in frozen fish tissue tend to become rancid quicker than fats in frozen animal tissues. 4. Pork has a higher shelf life than beef. Explanation: Beef has a higher shelf life than pork. Beef can stay for two years without becoming rancid whereas pork cannot stay after six months of storage. 5. Which of the following nutrients are lost in all steps of food engineering (including packaging and freezing)? Explanation: Vitamin loses are there in all stages of the food industry. 6. _____ is added to fruits prior to freezing commercially to protect their quality. Explanation: Ascorbic acid is added to fruits prior to freezing commercially to protect their quality. 7. Which of the following is correct with respect to carotenes? Explanation: All of the mentioned is correct with respect to carotenes. 8. Same alteration in pattern of freezing does not take place between two pieces of meat say beef and lamb. Explanation: There is no change in the freezing curve of lamb but there is a notable change in the freezing curve of beef. 9. Statement 1: Fruits and vegetable tissues are more prone to freezing and thawing damages than animal tissues. Statement 2: Standard refrigeration temperature in storage units is around -34 deg C. Above that, certain changes are observed. Explanation: Fruits and vegetable tissues are more prone to freezing and thawing damages than animal tissues. Standard refrigeration temperature in storage units is around -34 deg C. Above that, certain changes are observed. 10. Statement 1: Changes in chicken and fish flesh such as decomposition due to enzymes is desirable. Statement 2: Decomposition in beef is not desirable. Explanation: Changes in chicken and fish flesh such as decomposition due to enzymes is NOT desirable as it leads to aging. Whereas Decomposition in beef is desirable as it makes the beef more tender. 11. Statement 1: At temperatures just below 0 deg C, staling of bread is rapid. Statement 2: Composing and blending of the mix for production of ice-cream is a continuous process. Explanation: At low temperatures, bread does not get spoiled, but, just below 0 deg C, staling of bread is rapid. Composing and blending of the mix for production of ice-cream is a batch process where each ingredient is measured and added for every batch.